Join Vagabundos del Mar & Caravanas de Mexico for one of the worlds great railway journeys to Spectacular Copper Canyon. For the Spring 2020 season, we are offering a 30 day trip. Our tour includes a 4 day all inclusive Copper Canyon segment along with tours & meals in El Fuerte, San Carlos & Mazatlan. Copper Canyon in January / February can be cool, so unlike our competitors, we provide a nice warm week on the beach in Teacapan & Mazatlan after the Canyon, with included tours there. This trip offers a Colonial City West Coast beaches extension of an extra 35 days. You may find a schedule of this seasons Copper Canyon tours by selecting the "Tours" button above. If you are interested in our longer caravans, select the "Long Caravans" button above. See Copper Canyon Article. Note: Our prices are per rig based on 2 people. They are based on the Canadian dollar, but quoted in both US & Canadian. There is a reduction for singles and a surcharge for 3 or more. Our 2020 Copper Canyon trip leaves in mid January and is 30 days long. For those already in Mexico, we offer "a la carte" selections of any portion of our tours. For example, if you wish to join us in El Fuerte using your own means to get there, we will sell you just the Copper Canyon portion (approx $750 US pp). 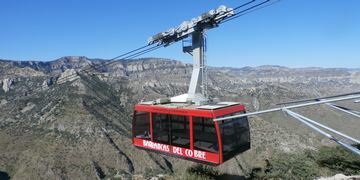 Or Copper Canyon plus the activities in El Fuerte, for an additional charge. 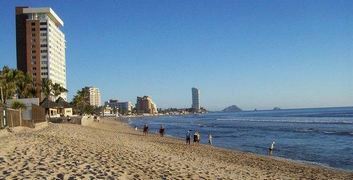 You may also select our day tours in Mazatlan, Alamos or San Carlos. Contact us for more information & prices. You can check the itinerary page on our main web site for the dates we are at various locations. 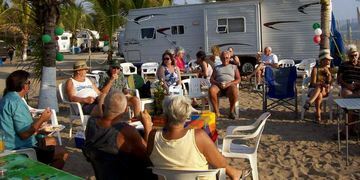 We also do a few trips per year out of other Mexican locations through our local "travel clubs" using buses or flights. Not only to Copper Canyon and in both English & French. Travel Club locations include Puerto Vallarta & Oaxaca. If you are in those areas we can put you in touch with them. If you are already in Mexico or planning to RV on your own, with advance notice, we will also sell you any of the tours en route scheduled with our longer caravans, such as the Monarch Butterfly Reserve or city tours (if space is available). Check with us for pricing. You will require a vehicle permit (we assist) and you may have to pay a $200-$400 US deposit on your vehicle. This will be returned to you when you cross back into the US. In Spring especially, you will require warm clothing for the cold nights in Copper Canyon (It can drop below freezing at night). You will also require good footwear and a bathing suit. Never fear, you have a week to roast on the beach in Mazatlan afterwards. You will need passports, vehicle registration papers, Mexican vehicle Insurance, and you have to get a Mexican Tourist card (we assist). All size rigs are OK for this trip, except those towed by Semi's (HDT's) . ULSD diesel should be available everywhere by Dec 2018, However, we have list from Pemex of stations that are supposedly selling it along this route. Reliable pet sitting can be arranged for the Copper Canyon portion.